I like travel so I always look for some tourist guide book when I enter a book store. It is not easy to travel to other country especially you have never been there before. You must read some tourist guide books that describe local culture before you go, but if you have a local tourist guide takes you around the that area it should be be very comfortable. 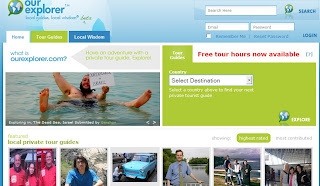 Our Explorer is an online tourist guide community, it helps you pick up professional tourist guide. It is simple to join it. After you registered you can pick up your destination on main page, you can search it by country, city. Our Explorer offers a list professional local tourist guide, you can find a tourist guide suits you. After all done, it will help you book it securely. If you are interesting about be a local tourist guide in your area you can also apply it.